This broad category also includes posts about government spying and information gathering. Facebook, Google, Microsoft, Twitter, and Yahoo! have all revealed that the United States Government has requested the personal user data for thousands of users. Today, Apple also disclosed details about how much private data they have given to the law enforcement and intelligence agencies of various governments around the world. In the spirit of transparency and disclosure, Communist China and Communist Russia allow companies to provide details about the number of requests made. Unfortunately, the U.S. Government prohibits any disclosure of specific details regarding how many thousands of requests it has made. This helps keep the citizenry in the dark. Perhaps most important, our business does not depend on collecting personal data. We have no interest in amassing personal information about our customers. We protect personal conversations by providing end-to-end encryption over iMessage and FaceTime. We do not store location data, Maps searches, or Siri requests in any identifiable form. … Unlike many other companies dealing with requests for customer data from government agencies, Apple’s main business is not about collecting information. 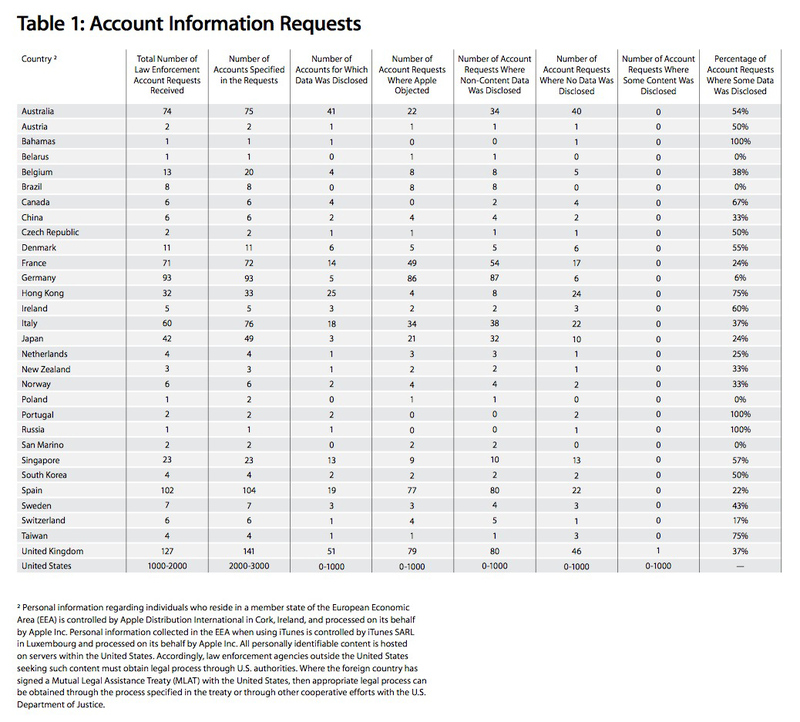 The chart below provides detailed information about the number and nature of requests for data. As you’ll see, the United States makes 10 times more requests than other countries. Click the chart for a larger view. When governments are secretive and invade people’s privacy, how does this make citizens feel? Will those who are spied upon be more likely to participate in self-governance by voting and running for public office? Is Apple doing enough to reduce the exposure that customers have when it comes to storing data that might be vulnerable to snooping governments or hackers? What are examples of when it would be okay for a company to hand over private personal data and records?